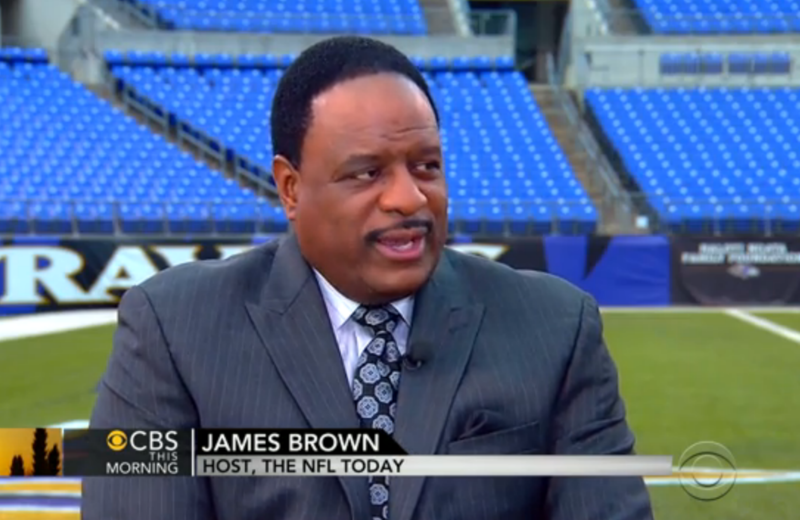 In a speech for the ages, CBS sports broadcaster James Brown stands up to toxic masculinity. The pregame program of the profoundly awkward Thursday night CBS game between the Pittsburgh Steelers and the Baltimore Ravens was on a toboggan ride toward collective mortification. An NFL reeling from the revealed reality that it cares nothing about domestic violence—or women at all beyond their capacity to buy its crap—was in a drowning death grip with a CBS network that had spent billions on its new Thursday night NFL package. On the day of the broadcast, CBS realized that having a pregame video of Rihanna, who before this week could safely be called the most well-known domestic violence survivor on the planet, did not seem like the best of ideas. The network also belatedly came to understand that it could not just light some fireworks and pretend this was business as usual, not when Jon Stewart, gesturing for so many of us, took time Wednesday night to give the league a one-finger salute. Not when NFL Commissioner Roger Goodell was continuing in real time to drown in lies about what he knew and when he knew it. So CBS responded to the mushrooming scandal by putting on its “Bizarro Olivia Pope” hat and revamped the entire operation. Struck from the set was the Rihanna opener. Smashed to smithereens was the pomp and fireworks. Instead, CBS presented an awkward, hybrid news/sports/entertainment set featuring respected members of its news division alongside the CBS and NFL Network jockocracy. “Norah O’Donnell and Deion Sanders break down domestic violence, only on CBS!” Clearly the golden goose had to be saved. All hands were on deck, and any pretense of a separation between CBS’ news and entertainment wings, or between CBS and the NFL, were out the window. Instead, we had Baltimore Ravens owner Steve Bisciotti speaking about this being “a seminal moment for domestic violence” and a series of pregame news reports about the “sobriety” of this moment. The method was obvious: if CBS and the NFL—together!—could show that they take domestic violence seriously, then fans could exhale and, having its guilt at watching Goodell’s league expiated, sit back to enjoy the commodified violence on the field of play. It was just “Are you ready for some football?” except instead of Hank Williams Jr., Scott Pelley was on hand to get us in the mood. The entire operation felt about as sincere as Roger Goodell’s “independent” investigation into whether the NFL had seen the tape of Ray Rice removing his then-fiancée Janay from consciousness. Consider this: according to domestic violence experts, more than three women per day lose their lives at the hands of their partners. That means that since the night February 15th in Atlantic City [when the elevator incident occurred], more than 600 women have died. Damn. Thank you, James Brown. Thank you for speaking up and speaking out. Thank you for using your platform for some good. The historian Howard Zinn famously once said, “There is no flag large enough to cover the shame of killing innocent people.” There is also no “internal investigation” deep enough, no pregame show somber enough, no press conference emotional enough, to cover the shame of how the the culture of the NFL has enabled violence against women both inside and outside the league. There are many roads that lead toward ending domestic violence: fighting poverty, creating more resources for survivors and building a less degrading society are all imperatives. But in addition to that, domestic violence will never end until men see it as both a political principle and a moral imperative to stand up and say, “No more.” In front of an audience of millions, James Brown has officially launched that conversation.